With a punt at the base to aid aeration, this visually appealing glass decanter will enhance your wine experience. Room underneath gives allows you to hold decanter at bottom – while holding at the neck- for easier pouring. The Wine Enthusiast Decanter for "U." With a punt at the base to aid aeration, this visually appealing glass decanter will enhance your wine experience. Room underneath gives allows you to hold decanter at bottom – while holding at the neck for easier pouring. Dishwasher safe. Note: Monogrammed means you get three letters. The letter in the middle is the largest. Typically the monogram is in the following order: first name initial, last name initial, middle name initial. This is the only way this is sold. Size or font can not be changed. Is it possible to get this decanter with a logo instead of a monogram? BEST ANSWER: I believe that it can be done. Call to make sure. They engraved ours with a different font when I asked. It took a couple of days for them to get back to me. They had to contact the engraver to see if it was possible. I want to get this monogrammed for a newly engaged couple with their initials. Last name initial is D, her first name initial is N and his is D. I'm assuming I input it as NDD? BEST ANSWER: Hey Mary, I have ordered several of these for gifts. I love this decanter. I have ordered it two different ways. My friends who got married hyphenated their name so I had it engraved C&M i used the and sign in the middle. My niece, they both have the same first initial CHC. So to answer your question yes use their first initial and the last name NDD. Hope this helped . What a wonderful gift. Hey and make sure you get one for yourself too! I just used my middle initial for the center letter. 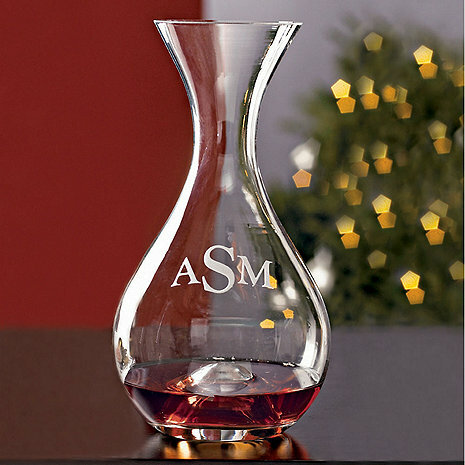 Is it possible to get Monogrammed Wine Enthusiast U Wine Decanter with the shield mongram? We absolutely love this decanter - it's clean, beautiful and does the job perfectly when breathing out a nice red wine. We couldn't be happier!!! I put the monogram into the computer incorrectly. I wish there was a pop up to show how it will look before ordering. My fault and we will still use it even though it says GED instead of GDE! Arrived promptly, perfect condition, and just what I was wanting. I plan to order two more. You cannot go wrong by ordering this decanter. from one location to another. We used it many times during the holidays. Delivery was sooner than predicted. I gifted this monogrammed decanter to my husband for Christmas. He loved it and used it that evening for Christmas dinner. It is sleek and not overly large yet can hold an ample amount of wine. Feels light but not cheap. Perfect addition to my husband's wine gadget collection. A great, useful & reasonable gift for any occasion! A very distinguished decanter. An absolute winner. Very nice item. Would recommend to others. Beautiful decanter with a lovely monogram! My friends loved their Christmas gifts! Merry Christmas and thank you! It exceeded my expectations for quality. It was a gift for friends and they absolutely love it. I asked for this to be delivered by a certain date for my wife's birthday and they delivered!